Remember when Cyberpunk was cool, news reporters worried about teenage hackers, Y2K was the next big apocalypse, and we had movies of rebel geniuses overthrowing the system, a la Hackers or Johnny Mnemonic? Everything was up in the air during the rise of computers and the internet. Since then, however, the digital economy has become commonplace, hacking is big business, and we all know that the NSA is reading our emails. We’ve witnessed the birth of a new sort of prose, one of # tags and html coding. Rather than anarchy, we’ve another replacement for the shopping mall, for letter writing, for seeing family photos of people we don’t particularly care about. During this period, digital poetries has become a real thing, a place for new communities, a community which gave rise to listserves and Flarf, for new models for text production, and new ways for readers to construct and engage with poetry. 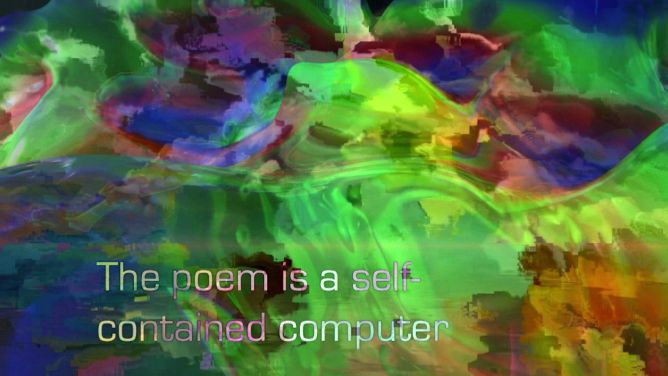 Poemfield3 by Alejandro Miguel Justino Crawford uses this new environment of possibilities, one in which poets have access to video and sound programs, in order to play with the plasticity of words, of images, and of meaning. 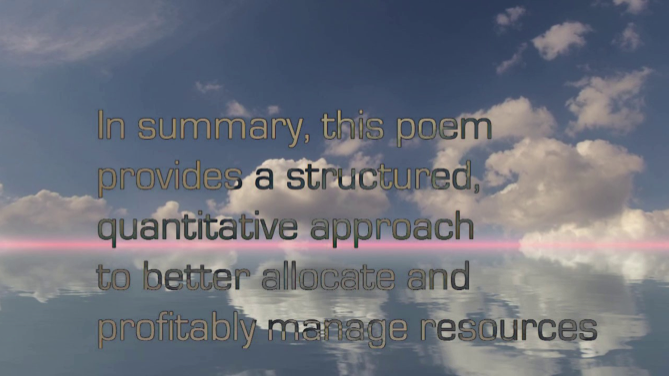 Additionally, poemfield3 utilizes the language of computer programs and profit margins to convey its subject matter, using crypto-business discourse and its particular jingoisms, as a means towards playing-with/ pushing-at the work of poetry in this brave new world where every desire becomes a digital business opportunity. In this usage of the language of business poemfield3 is pointing all the way back towards the French Symbolists and their concerns about the co-opting of language by capitalism. Simultaneously though, poemfield3 is enacting a poetics which recalls that earlier digital age of anarchic possibility, a DIY period where people were trying to figure how to profit from these new possibilities, and grandmothers were worried about worms infecting their computers. The inclusion of a 590 page pdf which presents the video through a computer programming script points towards this cyberpunk/open-source idealism. 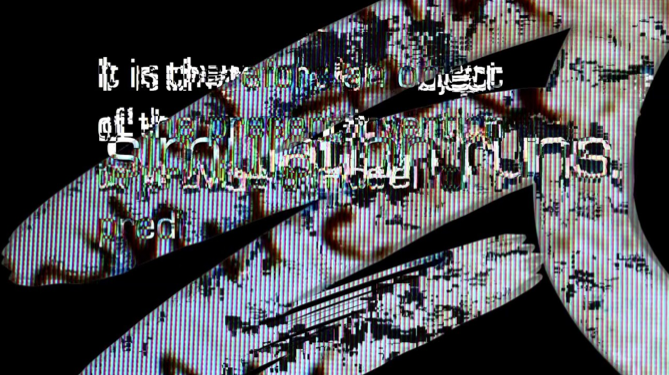 The video also feels very mid-90s cyberpunk, both in its electronic music and the ways in which the video evinces its own construction through visible mouse motions or misspelled words which are deleted and retyped onscreen. Often the viewer is at a loss as to exactly what’s being conveyed as the on-screen text moves in and out of focus, as fragments flash for microseconds, as scenes overlap, as text is erased. Something is being said, but its not until the end that the text begins to congeal, that any interpretive model begins to become clear. makes poemfield3 feel at times, particularly in the last half of the video, like its been drawn from the PowerPoint slides of some cabalistic business meeting purposed with finding ways to use poetry as a model for predicting future economies and profit margins. What’s interesting about this language is that it feels completely at home in the jingoistic realm of finance or business, yet completely foreign within the realm of poetry. Poetry, at least as I’ve always encountered it, is not profitable. 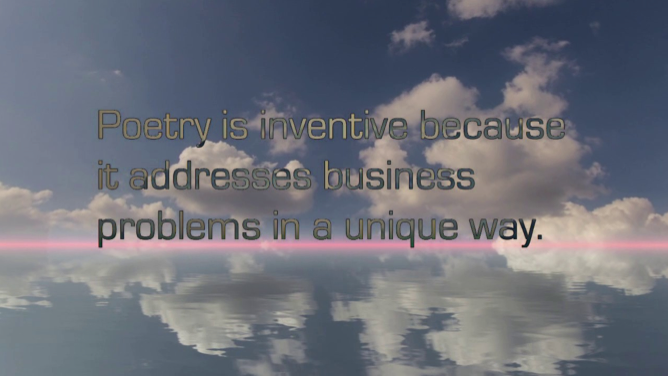 True, poetry is inventive, but could such inventiveness ever really address business problems? It is here where poemfield3 begins to reveal an underlying ironic appropriation. The digital age has always been sold to us as one of possibilities, as a paradigm shift which can deliver our desires. But poetry has always acted as a peripheral force, even within the broad environment of the internet. 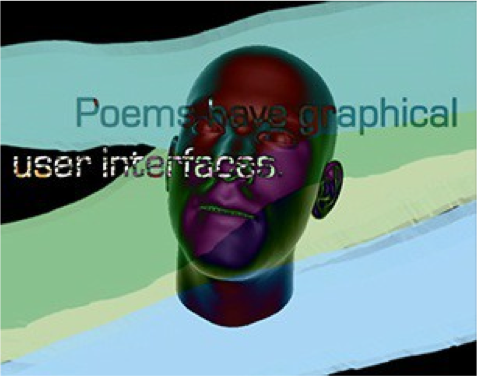 In other words, poetry will never really address business problems because it tends towards ambiguities, those same sorts of ambiguities which have been enacted within the video itself as words have been erased, morphed, inverted, etc— as any overt meaning has evaded the grasp of the viewer. In this way the video-poem presents certain claims while also undermining the veracity of these claims. The video is a call for invention which enacts its own inventiveness while simultaneously occulting itself behind an appropriated language of the business world. In total I see poemfield3 as a sort of pointing towards the possibilities of digital poetics and of the plasticities present within encounters of poetry and software. “Step forward” it invokes us. Aaron Pinnix lives, teaches and writes in NYC. His work can be found online and in various print journals. You can reach him at aaronpinnix@gmail.com.